Now honestly, Alison, do you REALLY need a tulle ballerina skirt? Nope. However, I have been really wanting one for a long time and wishing I never sold the black one I had from Express circa 1999. When I saw this one on eBay for such a sweet price, I decided to treat myself. Eh, it's not the best made item. While it says one size fits most, I think it only fits comfortably up to a size 10. The elastic waistbands twists, the slip inside is very fitted and sheer, it's not nearly as full as the photo, but it's fun. I think I will like it with my black blazer and think come winter it would be fun with a fitted boatneck or turtleneck sweater. Ladylike + casual + pattern mix = awesome! I love the knotted tee, it is an unexpected twist (literally!). I think everyone should have a skirt like this in their closet, just because! 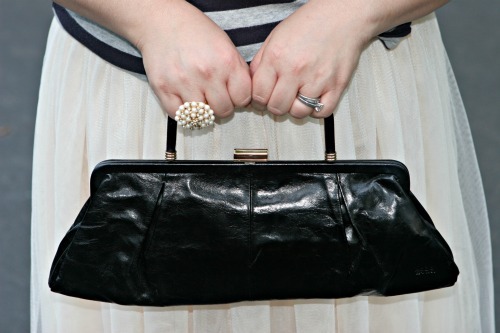 Love the pearls and that purse! I love the classics all together here in mainly monochrome. 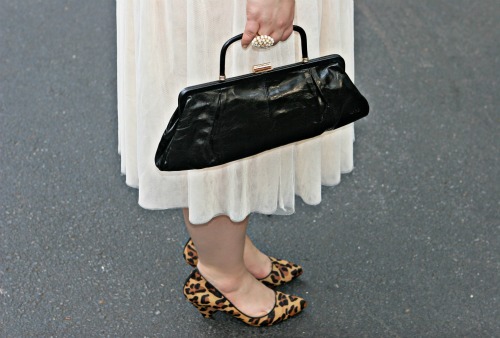 Princess skirt, stripe top, pearls and leopard. A winning outfit from head to toe! You look so beautiful in these pictures! Those stripes perfectly fit on you! And your necklace is very fabulous! Hey Alison! 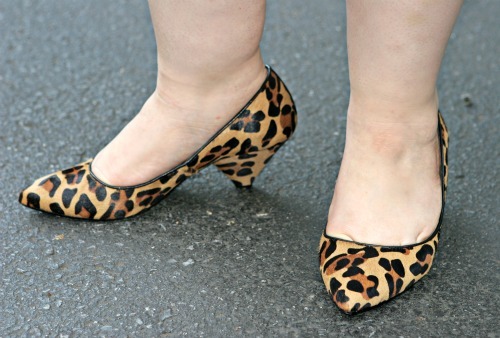 You’re looking a little like Carrie Bradshaw! Love that skirt and necklace! The stripes with the tulle is so pretty! I have a black one I got super cheap off ebay that’s one size fits all and I feel the same way about it! You have definitely inspired me! I have a light pink tutu skirt and was unsure of what to do with it as to not look too cutesy and a striped top is the answer! Love this and will definitely try it! I disagree, Allie… I DO think you needed this skirt. It’s adorable and I love that you grounded it with strong stripes and threw in a little leopard. One my fave looks of yours so far. Love this outfit! Especially the knot in the tee and ladylike bag! My favorite part of your outfit (which is fantastic, btw)? The expression on your face in the first shot! This outfit is so fabulous– I could see myself doing one very similarly, from the striped top to contrasting leopard shoes. LOVE IT. The skirt looks fantastic on you! 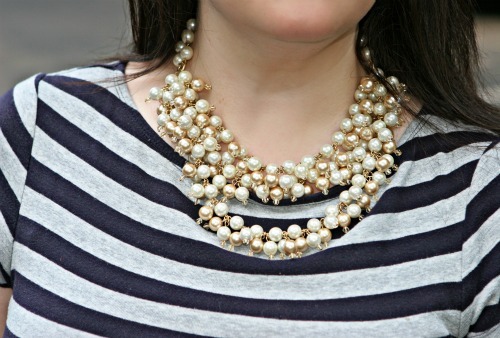 Love the addition of the pearl necklace to this look. You look so pretty. You just made my craptastik day a little better! I’ve always wanted one of these skirts! You look great!